The Enrich method provides the ability to get facts about a location or area. Using Enrich, you can get information about the people, places, and businesses in a specific area or within a certain distance or drive time from a location. More specifically, by submitting a point or polygon to the GeoEnrichment service, you can retrieve the demographics and other relevant characteristics associated with the surrounding area. You can also use Enrich to obtain additional geographic context—for example, the ZIP Code of a location or the geometry for a drive-time service area. 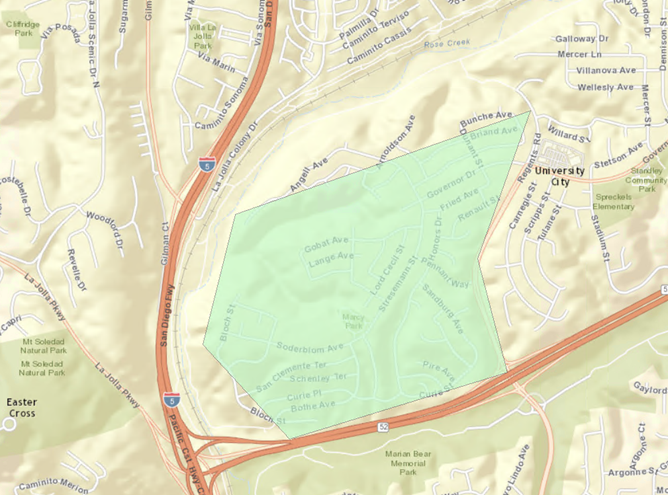 Required parameter: Study areas may be defined by input points, polygons, administrative boundaries or addresses. Optional parameter to specify a list of Data Collections. Optional parameter to specify a subset of variables to be returned from one or more data collections. Optional parameter to specify an array of string values that describe what derivative variables to include in the output. Optional parameter to specify the properties for the study area buffer. Optional parameter to explicitly specify the country or dataset to query. Optional parameter to explicitly define the geographic layers used to provide geographic context during the enrichment process. Optional parameter to request the output geometries in the response. Optional parameter to define the input geometries in the studyAreas parameter in a specified spatial reference system. Optional parameter to return only values that are not NULL in the output response. Adding the optional suppressNullValues parameter to any statistical data collections discovery method will reduce the size of the output that is returned. Optional parameter to specify the output response format. Required parameter for using the Enrich and Create Report operations of the GeoEnrichment service, which defines the area on a map which is being analyzed. Study areas can be input XY point locations, street addresses, map areas described as polygons, and map areas described as named administrative boundaries—for example, postal codes, states, ZIP Codes. It is also possible to specify a buffer around the input location like a ring or network service area using this parameter. This parameter can also be used to request statistics the levels of geography that intersect the input study area, like zip code or county. When points are specified as studyAreas, the service will analyze map areas surrounding or associated with the input point locations. Unless otherwise specified, the service will analyze a one mile ring around a point. This is also true for a line. Separate map areas described as multiple named administrative boundaries—for example, U.S. ZIP Codes. The ArcGIS Online Network Service Area Solver and World Geocode service support the GeoEnrichment service by analyzing the points submitted as studyAreas and the areas around the points. A network service area and ring request sent to the GeoEnrichment service is bound by the supporting services and may not exceed 300 miles or 300 minutes (5 hours). Supported bufferUnits include meters, kilometers, feet, yards, miles, nautical miles, seconds, minutes, and hours, as well as the units that were supported in legacy area types for DriveTimeBuffer and DriveTimeBufferBands. These units include esriMeters, esriKilometers, esriMiles, esriYards, esriDriveTimeUnitsSeconds, esriDriveTimeUnitsMinutes, esriDriveTimeUnitsHours. When specifying addresses for studyAreas, only matched (successfully geocoded) addresses will be enriched. Field input addresses are dependent on the geocoder used in the GeoEnrichment service. 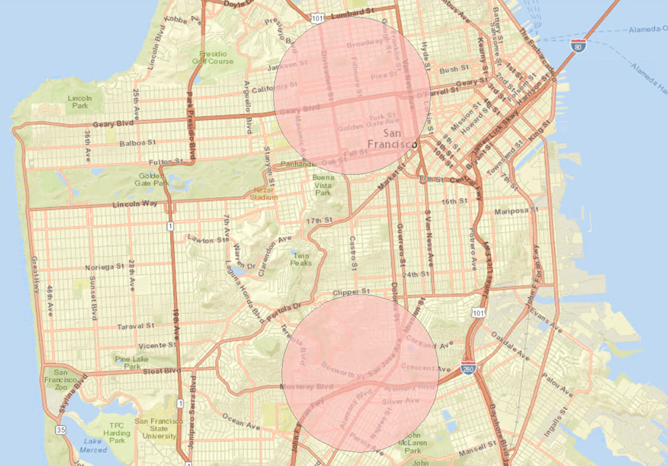 Changes in the geocoding service may require changes in the supported GeoEnrichment fields. You can use the Standard Geography Query lookup service to find the IDs for named statistical features. All input feature attributes, if provided, will be carried over into the output response. If the input attributes are unique to each input feature, this behavior can be leveraged to uniquely bind or associate the input features with the corresponding output features. If the input features are submitted without attributes, an "id" attribute will be appended to each feature in the output response. The "id" attribute values will represent the zero-based array index of the input features submitted with the studyAreas parameter. The request sent to the service cannot be greater than 10mb. Currently, a maximum of 100 features can be enriched with the service per request. A Data Collection is a preassembled list of attributes that will be used to enrich the input features. Enrichment attributes can describe various types of information such as demographic characteristics and geographic context of the locations or areas submitted as input features in studyAreas. A standard list of enrichment attributes. A Data Collection is a preassembled list of attributes that will be used to enrich the input features. With the analysisVariables parameter you can return a subset of variables Enrichment attributes can describe various types of information such as demographic characteristics and geographic context of the locations or areas submitted as input features in studyAreas. The Data Collection for an analysis variable should be appended before an analysis variable. You can use an asterisk to return all variables for a given data collection—for example, KeyGlobalFacts.*. Support the use of the derivative statistics can also be performed in the enrich operation through the analysisVariables parameter. "alias" : "Population to polygon size rating for the country"
"alias" : "Apportionment confidence for the country"
This parameter is only applicable to input study areas that are based on points. This parameter is not needed and ignored for input polygon study areas. This parameter should only be set for input points, street address and point-based feature service-based study areas. Optional parameter to explicitly specify the country and optional dataset to query. When all input features specified in the studyAreas parameter describe locations or areas that lie in the same country or dataset, this optional parameter can be specified to provide an additional performance hint to the service. By default, the service will automatically determine the country or dataset that is associated with each location or area submitted in the studyAreas parameter; however, there is an associated computational cost that can lengthen the time it takes to return a response. To skip this intermediate step and potentially improve the speed and performance of the service, the caller can specify the country or dataset information up front through this parameter. The default behavior will be followed. As an alternative, datasets in GeoEnrichment could be replaced with hierarchies. For many countries there will be a single "default" hierarchy of geographies but for US there will be two hierarchies: "default" and "landscape"
GeoEnrichment is available for a number of countries described in the coverage section of the documentation. New countries will be added in the future. You can now navigate using the ISO standardized two-digit country code for each country. Optional parameter to explicitly define the geographic layers used to provide geographic context during the enrichment process. For example, you can use this optional parameter to return the U.S. county and ZIP Code that each input study area intersects. You can intersect input features defined in the studyAreas parameter with standard geography layers that are provided be the GeoEnrichment service for each country. You can also intersect features from a publicly available feature service. Used to specify the type of intersection layer. Specify standard to intersect with standard geography layers that are provided by the GeoEnrichment service for each country. Specify external to intersect features from a publicly available feature service. Specifies which Standard Geography layer should be intersected—for example, U.S.Counties. These are an array of layers, so you can set one or many layers to intersect. These layers are defined in the Coverage section. At least one layer must be defined if geographyType is set to standard. Optional URL if you want to intersect features from an external feature service. This layer must be defined if geographyType is set to external. Optional alias name of the output geography layer being intersected. For example, you can set the name of US.Counties to Counties in the GeoEnrichment output. Specifies how input studyAreas should intersect specified geography. If this is set to esriGeometryPoint, one intersecting feature is returned that intersects the centroid of each input polygon. If this is set to esriGeometryPolygon, all intersecting features are returned that intersect the input study area polygon. You can optionally define the list of output fields from the intersected layer that will be appended to the GeoEnrichment response as geocontext items. The optional spatial relationship to be applied on the intersecting layer. The supported spatial relationships include intersects, contains, envelope intersects, within, and so on. The default spatial relationship is intersects (esriSpatialRelIntersects). You can define an optional where clause. No intersecting geographies will be included in the output response. When this parameter is set to true, the output geometries associated with each feature will be included in the response. The output geometries will be in the spatial reference system defined by outSR. The output geometries will not be returned with each feature in the response. Requesting output geometries can significantly increase the payload size of the output response which will increase the amount of time it takes to receive the response and negatively affect the speed and performance of any client applications consuming the service. When input points are defined in the studyAreas parameter, this optional parameter can be specified to explicitly indicate the spatial reference system of the point features. The parameter value can be specified as the well-known ID describing the projected coordinate system or geographic coordinate system. The standard latitude and longitude-based geographic coordinate system based on the WGS 1984 datum will be used. Optional parameter to request the output geometries in a specified spatial reference system. When returnGeometry is set to true, this optional parameter can be specified to explicitly indicate the spatial reference system of the output geometry. The parameter value can be specified as the well-known ID describing the projected coordinate system or geographic coordinate system. Setting this optional parameter to true will significantly reduce the size of the output of the statistical data collection response. You will have to handle duck typed cases where some metadata may not be returned for a given variables because a value is set to NULL. The output response will be returned in HTML format. Supported formats include JSON and XML. Enrich a single area defined by a polygon feature with attributes defined in a specified Data Collection and include the associated geometry in the response. Optionally, rename the polygon and include information about all of the boundary areas within the three default administrative levels that intersect any part of the input area. "DPOPRES_CY": "2018 Daytime Pop: Residents"
A list of attributes describing the area's demographic characteristics and geographic context, as defined in the default Data Collection, is returned in the response. User defined attributes are submitted with the input feature and will be carried over into the response. This can be useful in associating the input feature with the output. 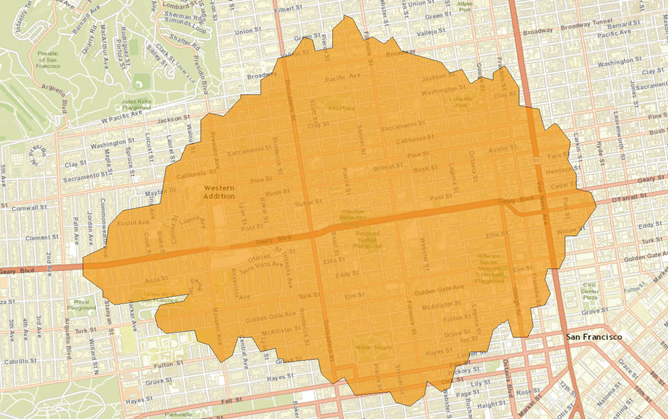 JSON response rendered with ArcGIS for Desktop. Transparency and fill properties have been adjusted for illustrative purposes. Enrich a single area defined by a polygon feature with attributes defined in a specified Data Collection and include information about all of the boundary areas within the three default administrative levels that intersect any part of the input area. "DPOPRES_CY" : "2018 Daytime Pop: Residents"
The response has been abbreviated in the example where "..." is noted. A list of attributes describing the area's demographic characteristics and geographic context, as defined in the KeyUSFacts Data Collection, is returned in the response. The default geographic context that is returned in all responses includes the descriptions of three levels of administrative areas: the country level, the first level major administrative boundary level such as state or province, and the ZIP (U.S.) or postal code level. In studyAreasOptions, an intersection relationship has been specified and will result in the inclusion of the descriptions of all of the boundary areas from the three default administrative levels that intersect any part of the input area to be included in the response. Enrich a single location defined by a single-line address with a 15 minute walk time buffer. Attributes are defined in a specified Data Collection and geometry is returned. A 15 minute walk time buffer area is generated around the input location. A list of attributes describing the location's demographic characteristics and geographic context, as defined in the default Data Collection and based on the generated area, is returned in the response. The service supports the geocoding parameters of the ArcGIS Online World Geocoding service. Transparency property have been adjusted for illustrative purposes. Enrich a single location defined by latitude and longitude coordinates and include the associated geometry in the response. 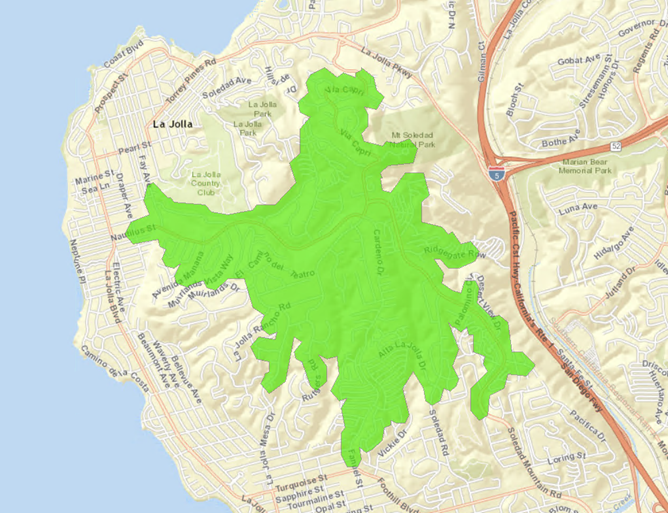 Instead of the default 1-mile ring buffer, generate a drive time service area. A 5 minute drive time service area is generated as specified in the bufferUnits, bufferRadii and travel_mode parameters. The default data collection of Key Global Facts is used. Simultaneously enrich locations in multiple countries or datasets defined by latitude and longitude coordinates with attributes defined from the default statistical data collection (KeyGlobalFacts). A 1-mile ring buffer area is generated around each input location and the associated geometry is returned in the response. A list of attributes describing each location's demographic characteristics and geographic context, as defined in the KeyGlobalFacts statistical data collection and based on the generated areas, is returned in the response. Simultaneously enrich multiple locations in a single country defined by latitude and longitude coordinates with attributes defined in a specified statistical data collection and include the associated geometry in the response. Additionally, specify the country or dataset through the useData parameter to provide the service with a performance hint. Further information about the significant benefits of explicitly specifying the country or dataset in advance can be found in the useData parameter description. A 1-mile ring buffer area is generated around each input location. A list of attributes describing each location's demographic characteristics and geographic context, as defined in the KeyUSFacts statistical data collection and based on the generated areas, is returned in the response. Enrich an area consisting of the union of multiple areas within the same administrative boundary data layer with attributes defined in the Data Collection. Rather than specifying the polygon feature, identifiers are used to specify two U.S. ZIP Codes in the example. Named administrative boundary areas can be looked up with administrative boundary lookup or utility services. The union function can be specified on administrative boundary areas by specifying the comma-delimited area IDs within the same string (rather than in separate strings) in the ids array. Simultaneously enrich multiple locations in a single country defined by latitude and longitude coordinates with attributes defined in a specified statistical data collection. Instead of generating the default 1-mile ring buffer areas for all locations, you will generate and use varying ring buffer areas around each location. A 1-mile ring buffer area is generated around the first input location and a 5-mile ring buffer area is generated around the second input location. Return the state of California study area in the most generalized geometry. You only need to specify generalizationLevel if returnGeometry is set to true. Generalization levels are from 0 through 6 with 0 being the most detailed and 6 being the most generalized. You can't return more than one feature in a detailed geometry. Encapsulating a returned FeatureSet into the studyAreas parameter to create rings around each point and enriching each of the ring buffers. Using the feature service you can query and return the following FeatureSet which will be encapsulated into the studyAreas parameter. Set a drive time buffer from a defined point and return total households and median household income for the current year with the associated geometry in the response. "MEDHINC_CY" : "2018 Median Household Income"
A 5-minute drivetime buffer area is generated around the input location. Return a statistical data collection with the additional variables and associated metadata for index values.